Gionee previously held the world’s thinnest smartphone title for a while with the Elife S5.1, which measures at only 5.15mm. But it didn’t take too long for the title to be taken away by other manufacturers. Gionee hopes to change this come MWC 2015, promising a new ultra-slim smartphone that will not sacrifice performance in order to be thin. The company said that “manufacturers made sacrifices such as eliminating the headphone jack, a protruding rear camera, shortening of the battery life, and a thin frame that brings about heating issues and a bad signal.” Most, if not all of these apply to the Oppo R5, which made these “sacrifices” in order to be as thin as possible at 4.85mm. 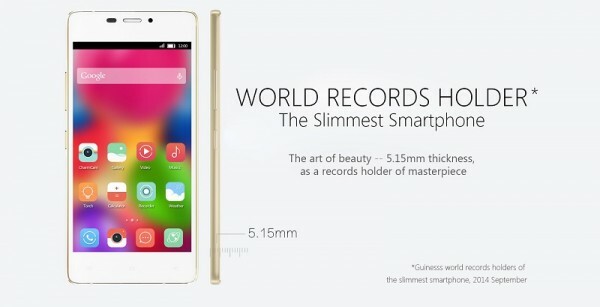 The race to make the slimmest smartphone was getting out of hand. Going so slim is actually not benefiting user experience without the performance to back it up. – Head of Global Marketing of Gionee, Oliver Sha. It’s definitely a bold statement from the Chinese company. As for Gionee’s plan at MWC 2015, it will unveil a new smartphone that will be “beyond slim,” which will not compromise on performance, design, or technology. Unless Gionee has a revolutionary new design, it will be interesting to see how it will build an extremely thin smartphone without sacrificing other specifications such as the size of the battery. In any case, it’s refreshing to see a manufacturer acknowledging the sacrifices made to taper down a phone’s thickness. Gionee’s new smartphone will be unveiled on the 2nd of March at MWC 2015.